When anthropologists and archaeologists want to acquaint themselves with past civilizations and absorb the information necessary to visualize how people lived in times long ago, they look for historical texts. Whether they come in the form of hieroglyphs, scrolls, or cave paintings, the keys to unlocking values and lifestyles of past cultures lie in the press. If, far into the future, an anthropologist cared to reconstruct our culture, through a news source available today, which would he choose? One of the most renowned papers in the United States today is, undoubtedly, The Wall Street Journal. The Journal is the largest newspaper in the U.S, by circulation. Named after the street in the heart of New York City’s financial district, the paper was conceived in 1889 and has been printed continuously since. It is published by Dow Jones & Company, which was founded by Charles Dow, Edward Jones, and Charles Bergstresser. Thus far, the newspaper has won the Pulitzer Prize thirty-three times. The paper has changed hands and styles to adjust with changes in social movements and cultural transitions throughout history. In 1902, The Wall Street Journal was purchased by Clarence Barron, who was best known for instilling an atmosphere of fearless, independent financial reporting. However, it wasn’t until the 1940’s when the success of the paper soared along with the industrial expansion of the decade and under the leadership of Bernard Kilgore, who was named managing editor in 1941 and CEO in 1945. Kilgore is responsible for designing the iconic front page layout that’s still used today, and for the paper’s initial international distribution strategy. In 1967, under Bernard Kilgore’s watch, the paper received its first Pulitzer Prize for editorial writing. While The Wall Street Journal struggled through the 1990’s, with declining advertising and rising print costs, it developed innovative solutions to adjust to shifts in cultural trends that allowed it to stay afloat and eventually return to the pinnacle of its potential. 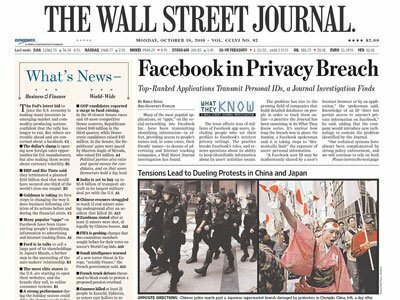 In 2004, Oasys mobile teamed up with The Wall Street Journal to release an application that allowed users to access newspaper content from their mobile phones, and in 2007, Dow Jones entered into a definitive merger agreement with News Corp, an arrangement that was originally rejected by Dow Jones, but later reconsidered. The design of the newspaper, though remaining largely true to form, has made a couple notable shifts since its conception. In 1979, Kevin Sprouls introduced the concept of head cuts as a consistent visual signature. Most notably used in Journal biographies, headcuts have remained a signature of the paper since the 1970’s. To the right is an example of the headcut style, used for the bio of KKR’s Henry Kravis. Henry Kravis’s bio was published along with major faces of the New York and international business community. Caricatures are another WSJ signature, especially those of Ken Fallin. Though this publication sometimes draws criticism, as every publication does, one criticism that cannot be claimed in regards to The Wall Street Journal is a lack of voice. If anthropologists were to look back on this time and read the works of WSJ writers, they would most certainly have the ability to pinpoint cultural values and shifts in our society, and be exposed to the hearty voice of the largest-circulating newspaper in the United States.